Born in Barvinkovo, Kharkiv reg., Ukraine. Studied at Yalta's Art School (1939); at studio "Vsekokhudozhnik" with B.Ioganson in Moscow (1947). Participated in Republican exhibitions from 1954; All-Union exhibitions from 1955; solo exhibitions - Yalta, 1956; Simpheropol, Sebastopl, Yalta, 1960, 1964. Awarded medal - 'Merited Artist'. Main works are: "Morning in Port" (1955); "Genoa Fortress" (1959); "Daugava. Morning." 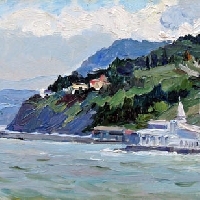 (1961); "On Riga Seashore" (1961); "Sudak. Twilight." (1967); "First days" (1968); "Fresh Wind" (1971); "Afternoon in Cocktebel" (1977); "Moonlit Night" (1987); "Lilacs" (1988). Literature: "Stepan Kalinovich Yarovoi", 1990.